From product, to film, to restaurant reviews, the internet has given everyone a voice to share their opinions on just about anything. This has made reviews an important part of modern life, with an abundance available online. With so many reviews just a mouse click away, most of us read them before making any kind of purchase decision. In fact, 88% of us trust online reviews more than personal recommendations in the offline world. With such credence now given to online reviews, there’s a lot of money to be made from them, and so it’s no surprise that a plethora of dedicated websites have cropped up over the years — from big-name sites such as Rotten Tomatoes or TripAdvisor to niche affiliate websites. Just look at the Amazon boom, which has a lot to thank for the successful integration of prominent customer reviews. As long as there are products in your niche, you have the opportunity to write reviews. This makes them ideal for bloggers, who can turn to reviews when stuck for post ideas. For those of you running a blog, as well as providing genuinely useful content, you’ll want to make sure your reviews look nice. For this, you’ll need dedicated functionality. As you may have guessed, that’s the purpose of this post. I’ll be sharing five of the best WordPress review plugins you can use to add beautiful reviews to your website. Enjoy! 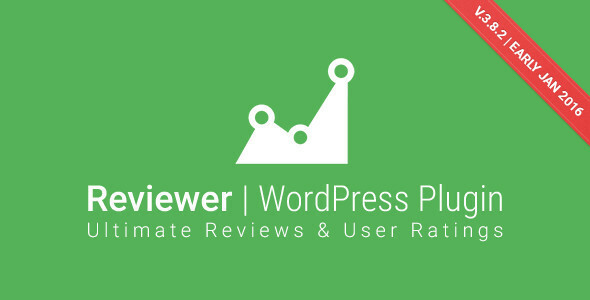 I’ll kick things off with one of the top-rated review plugins: WP Review Pro. This plugin is available from MyThemeShop for just $29, with the price including round-the-clock support for one year. The reviews look clean and professional, with eye-catching CSS animations commanding immediate attention from your audience. These reviews are fully customizable, too, with WP Review Pro offering full control of your color scheme (unlimited colors), review box size, and number of criteria. You can display your reviews in a fixed position on the page, or, if you’d prefer more flexibility, you can place them as and when required using a shortcode. 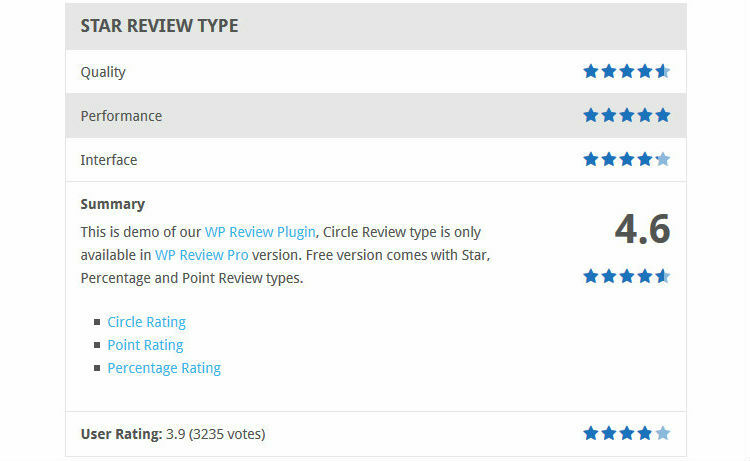 WP Review Pro also offers four review systems: star (/5), points (/10), circles (/100), or percentages (/100, of course!). 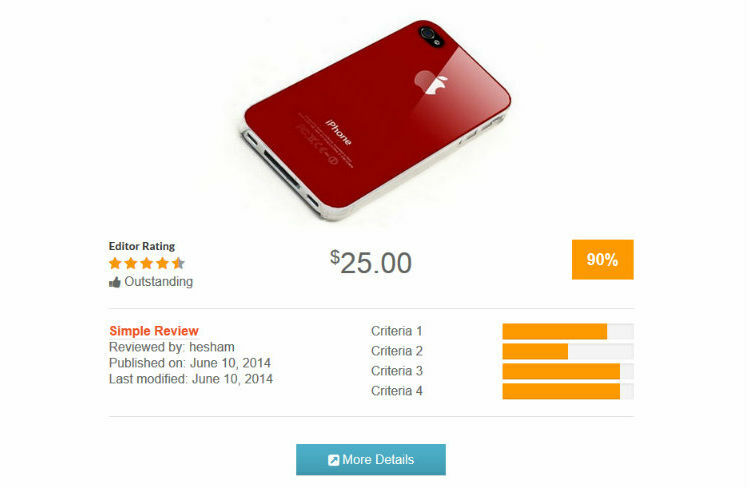 The overall rating can be placed on your post thumbnails, so visitors can easily find the best-rated items. To further improve navigation, the plugin ships with a tabbed review widget, too. Readers can also cast their opinion with a single-click rating, with these user reviews displayed at the bottom of the review box. Or, if a reader would prefer to share their thoughts in more detail, they can leave their review and rating via the comments at the bottom of the post. This extra information helps search engine users find relevant content, and is proven to boost CTR — good news for your SEO strategy. And, to further enhance your SEO performance, the plugin is speed optimized so it runs lightning fast. 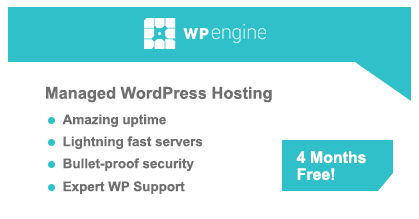 For further speed improvements, WP Review Pro is fully compatible with caching plugins, too. For those of you who are looking to try before you buy, a free version of the plugin is available, though with restricted features. Next up is, in my opinion the coolest of the review plugins, Taqyeem. You can pick it up for just $17 from CodeCanyon — a price that includes six months’ support. I’m a big fan of the plugin’s sleek design, with a dark and light theme available. Both themes can be fully customized with a choice of unlimited colors (get the right combination and these review boxes look gorgeous). You can also customize the typography from a selection of 600-plus Google fonts, and the summary boxes come in two sizes: full and half-width. Taqyeem also offers a choice of three review systems: stars, percentages, and points. It supports an unlimited number of custom criteria, too, and readers are free to leave user ratings. You can turn any post, page, or custom post type into a review by activating Taqyeem from a metabox below the text editor. All settings are controlled from within this metabox, and the review can be positioned at the top or bottom of the screen, or in a custom position by copying and pasting a shortcode. Reviews are easy to configure, and it should take no more than a minute or two. The plugin offers additional review functionality in the form of three dedicated widgets: best, recent, and random reviews, and also adds the relevant schema markup that populates rich snippets. Taqyeem Buttons Addon ($6) – add buttons to your review box, with unlimited colors and nearly 500 icons. You can point the button at your preferred URL, making it an easy way to add affiliate links. Taqyeem Predefined Criteria Addon ($7) – if you regularly use the same criteria set for your reviews, this extension allows you to re-use them and save time. For those of you working to a tight budget, WP Product Review Lite is a free plugin, brought to you by the highly regarded ThemeIsle developers. The plugin can turn any post into a review with just a single mouse click. The reviews are then configured directly below the text editor. The review boxes look fantastic — especially for a free plugin. The box is split into multiple parts, with space for a fixed number of criteria (and a rating out of 10), and pros and cons. You can also add a thumbnail image to the review box, as well as two affiliate links. 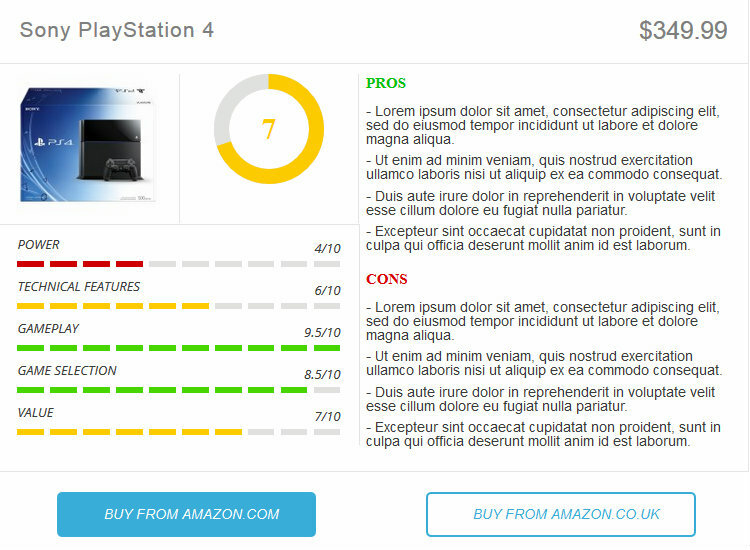 You can fully customize your reviews, too: WP Product Review offers a choice of typography, positioning, and colors. As well as the usual border color options, the plugin lets you select a different color based on the rating for each criterion — for example, you might use green for a high rating and red for a low rating. 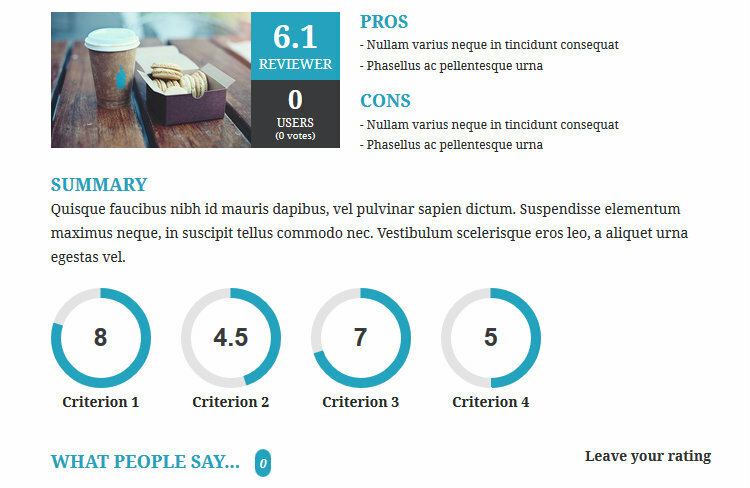 Offering users a platform to share their opinions is nothing new, but WP Product Review has an innovative twist: user ratings impact the overall review rating, with no separation between the two (although you can weight the user ratings to lessen/increase their impact on the overall rating from the settings screen). The plugin will also add Schema markup to your review posts automatically. WPPR Comparison Table ($35) – display products in a filterable table, allowing for quick comparisons and rankings. WPPR Easy Preloader ($20) – save features from previous review articles, and use them in the review you’re writing. 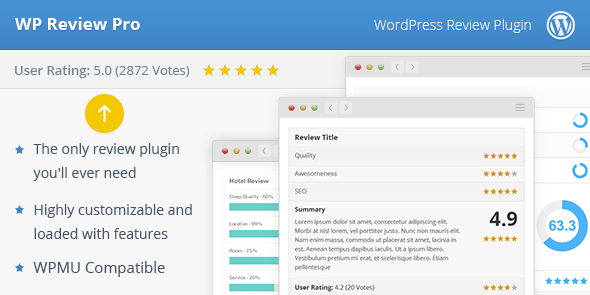 WPPR Single Review Shortcode ($20) – add reviews anywhere on your page using a shortcode. You can also use this extension to add multiple reviews to one page. WPPR Custom Icons ($15) – customize the star rating system with 13 premium icons. If you’d like to buy all four of these add-ons, a bundle is available for $59, saving you $41 off the full price. There is also a free add-on available, WPPR Related Reviews, which lets you add a review widget to your sidebar. WP Reviews is only available as part of a three-plugin bundle, costing $69. Also included in the bundle is the Author hReview plugin — another plugin boasting review functionality that complements WP Reviews — and WordPress Customer Testimonials. For the purpose of this post, though, we’ll focus on the WP Reviews plugin. The plugin creates clean and organized boxed reviews that include space for a large product image, product details, and an affiliate link button at the bottom. WP Reviews is also big on community integration, and the review boxes include space for both editor and user ratings. You can add an unlimited number of custom criteria, and the plugin will display the editor and user ratings for each. This is unlike the other plugins featured today, which typically only display the overall user rating. Reviews are added to your post using shortcodes, and the plugin supports two dedicated widgets: top reviews and recent reviews. It also adds schema markup by default, to boost CTR coming from the SERPs. If you want more features, the developer has released an additional premium extension: Front-end Reviews Submissions, worth $49. Using all of the functionality from the core WP Reviews plugin, this extension allows registered users to submit reviews to your website, but, to prevent poor quality reviews/spam from being displayed, you’ll have to approve the reviews before they are shown to the public. The final plugin is evoG’s Reviewer, available from CodeCanyon for $25. As with the other plugins we’ve discussed, these reviews are fully customizable — there are a number of rating systems, plus you have a choice of unlimited colors. However, unlike the other plugins, Reviewer ships with nine templates — each with a distinct style and layout. Plus you can customize them to your heart’s content. Reviewer also boasts one other innovative feature: comparison tables. This allows you to place review scores side by side, which makes comparisons more straightforward for your readers. The plugin is big on community, too, with readers given three options for sharing their opinions — either an overall rating, or a criterion-by-criterion rating using either a star or slider rating system. User reviews can be left via the comments, and Reviewer allows readers to sort comments by date, helpfulness, or high/low rating. This gives you plenty of review functionality for your sidebars, making your reviews much easier to navigate. WP Review Pro – best all-rounder. Taqyeem – most stylish reviews. WP Product Review Lite – best free option. WP Reviews – best for community integration. Reviewer – nine review templates to choose from. All plugins featured here allow you to build stylish review boxes, split your review into custom rating criteria, and add the relevant schema markup for rich snippets — in other words, the really essential review functionalities. What’s your favorite review plugin? Thoughts? I’d like to recommend you one more cool review plugin I’ve recently discovered for me! I used the Trustbadge reviews widget on my online shop https://www.litespot.co.uk/ to collect and show customer reviews. It’s fairly easy to use. They have many integrations in different shop systems. And it comes with 7 languages and is mobile-optimized. There’s a freemium version available at at http://www.trustbadge.com. Is WordPress Review Pro the only one to show the stars on Google? Maybe a strange question but for a new theme buyer, I presume (?) it might be advisable to get a theme with a built in review system? (Eg. Socially Viral, BEST theme, or nexus, few examples) ?? Word of warning here. “Reviewer” (the last one on the page), does not show its reviews on Google. Completely non-indexable. Worse than useless for my purposes. Hi MIke, looking for the same. any luck finding one that works? I didn’t see one review plugin here that mentions a way to get customers to write a review. Like Customer Reviews by ivole. His sends out a promo code to get them to write one. None of these do that. I thought I was looking for something simple and it’s turning out to be harder to find than I thought. I’m enjoying writing my own movie reviews in a section of my blog. I thought there’d be a plugin tailored to that – an image, some ratings (% mine & rotten tomatoes), and a large text block for my writing. I don’t need users to add to it at all. I’m doing so in blog format with Divi, but a custom plugin might make it look better than just a standard blog format.